Actor Nicholas Cage has been all over the internet lately because of a photo of a Civil War era man who is the spitting image of Cage as you can see for yourself. Jack Mord is selling the photograph on eBay for a cool $1 million. The man in the photo apparently lived in Bristol, Tennessee and does bear a striking resemblance to the Oscar winning actor. Mord says, "personally, I believe it's him and that he is some sort of walking undead vampire, et cetera, who quickens / reinvents himself once every 75 years or so. 150 years from now, he might be a politician, the leader of a cult or a talk show host." in Ohio. 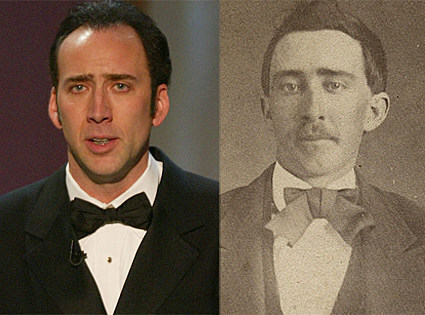 Whether Cage is a vampire or not, you have to admit, the resemblance is frightening.